One French art deco “soufflé” vase by Charles Schneider (1881 – 1953). 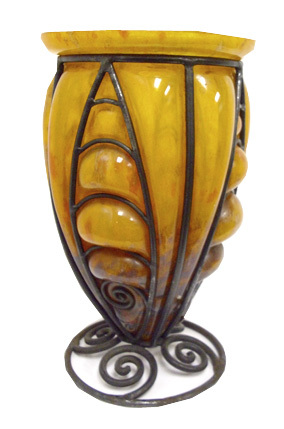 The vase in mottled amber glass internally decorated with rust, brown and yellow, blown into a wrought iron armature on wrought iron spirals base. The vase is 12” high and 7 1/8” in diameter and is signed “Schneider” on the base.